Weather has been hot and humid. Storms went through north of us early this morning, but we are expecting some kind of weather later today and into tomorrow. After that, 80s into the weekend. with very slight chances of rain. Just enough no generation the past couple days to wet your appetite. They had the water off yesterday until 11:00 a.m. or so, and again this morning. Think it is supposed to fire up at 9:00 a.m. Lots of folks on the water yesterday enjoying the “no generation” and good catching conditions. Hopefully, we won’t get a lot of rain out of this system moving through since we are still a couple feet above power pool. Saturday we had four boats on the water. Jim had a friend from Michigan, Chuck, out most of the day. They had a good day on the black zebra below the ruby midge. He tried pulling streamers that way (Jim’s favorite way to fish), but it just was not a streamer day. Stan had a half day on the water with Bob and and Matt,from Florida. The did well on the big ruby (yep, water was running) and either a black zebra dropper or the primrose & pearl midge. Darrell’s fairly new fly fishers, Morgan and Taylor, were from Springfield, MO. Once they got the hang of it, it was good on the big ruby and black zebra dropper. Carolyn had Lee and Meredith from Arkansas. Lee does quite a bit of fly fishing and can throw a line. Meredith it still new and actually boated her first trout on a fly rod Saturday. The morning started out very good. Fish were where they should be and I think we even had a double on on our second drift down the boat ramp bank. However, as Jim found out during the day and we confirmed, it was just not a streamer day, but we had a good day on the big ruby and either a lightening bug or hot hare’s ear nymph dropper. Did catch some early on the copper dun dropper. Several nice fish! Sunday it was Stan on the water with Mike from Oklahoma. Mike has been fishing with Stan for almost 10 years now! They had a nice, relaxing, catching day, mainly on the primrose & pearl midge. Darrell was working with a fairly new fly fisher, Brad. Brad is from Raymore, MO. They had a good day of learning and catching, on the primrose & pearl and black zebra midges. Jim too was in a teaching mode. He took Sam and his wife, Sharon from Oklahoma out for half a day. They learned at lot and caught some fish. black zebra and blood worm dropper, as well as the CQ streamer. 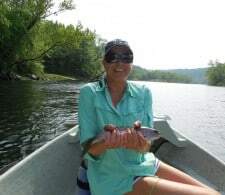 This entry was posted on Monday, May 20th, 2013 at 2:57 pm	and is filed under Fishing Reports. You can follow any responses to this entry through the RSS 2.0 feed. You can leave a response, or trackback from your own site.